After installation, why is the layout messed up and there are no images/colors on the login screen when I access from another computer? This issue is most commonly due to incorrect settings entered during installation. For example, if during the installation of a self-hosted MIDAS system, you specified that the URL at which your MIDAS system could be reached was http://localhost/midas, or http://127.0.0.1/midas - "localhost" and "127.0.0.1" are both local URL's referring to the particular computer or server upon which you installed the software. "local" URLS such as these would allow your MIDAS booking system to function correctly when accessed from that particular computer/server alone, but not from any other connected computers. Similarly, if during installation, you've specified that your MIDAS can be accessed via http://192.168.0.1/midas (i.e. an IP address within your own local intranet), only other "local" computers on the same network will be able to reach your MIDAS system. Therefore, if you require both other local and external users to be able to connect to your scheduling system, you will instead need to use the external IP/domain name of the server where your MIDAS resides, rather than a local IP/internal address/url, in order to allow remote connections to the machine. 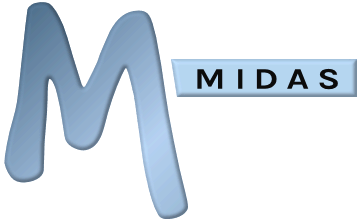 You can use our quick online self service tool to correct your MIDAS settings to reflect the external address/IP of your server. With the correct external address/URL to your MIDAS system applied, you should then be able to successfully access MIDAS from other computers and devices. Why does the layout appears wrong, and some visual elements are missing/in the wrong place after installing the software?